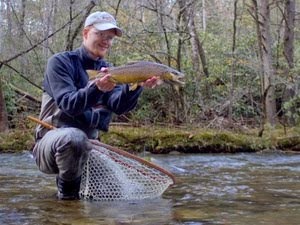 Last week, I had a great opportunity to fish with my dad, but it was a chance that almost didn't happen. 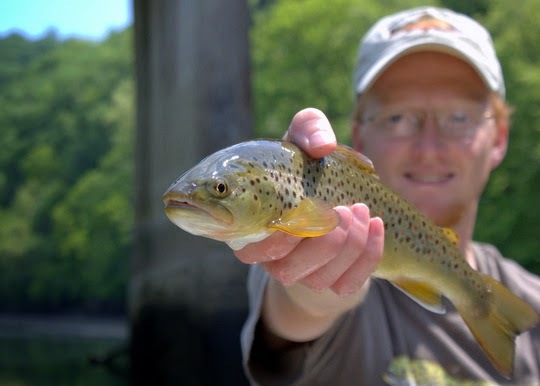 On Tuesday, I decided that I wanted to fish on Wednesday and based on how well the Monday guide trip went, I knew I had to get out on the Caney Fork. After a couple of texts to friends to see if any of them were free or wanted to ditch work, I figured I could check with my dad. At this point, it is important to emphasize that he really doesn't fish. Yes, he does enjoy going along with me from time to time, but getting him to actually go fishing is another thing. 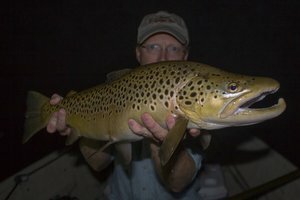 When he agreed to go along, I was pleasantly surprised to say the least and even more so when he agreed to fish on the trip! After a late night run to Walmart for a fishing license, we were ready for the next morning. A breakfast of waffles had me fueled up for a few hours of rowing, and when we threw some sandwiches and sides into the cooler along with some water, we were ready to go. Before long, we were dumping the boat and ready to float. I gave my dad the quick lecture on how to cast and then got him fishing. 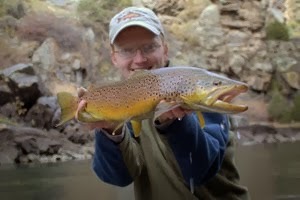 As is normal with most beginner fly fishermen, it took some time to figure out the whole "hook set" thing. I was using the boat to help achieve long drifts, subtly dipping an oar here or there to keep everything moving steadily and without drag. Several times, the indicator shot under and one fish even found itself briefly hooked, but still a fish in the net eluded us. Finally, I changed up patterns, adjusted the indicator, and not too long after we saw the indicator go down yet again. 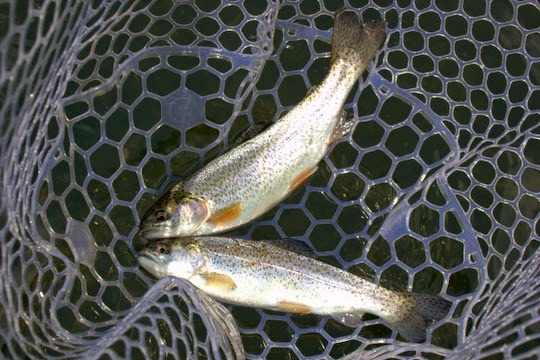 This time, dad came tight on a feisty rainbow trout that found its way into the net. Posing for a quick picture took a few seconds, and I soon had proof that my dad went fishing. The fish was freed to be caught again another day, and we continued drifting. One fish down helped a lot. 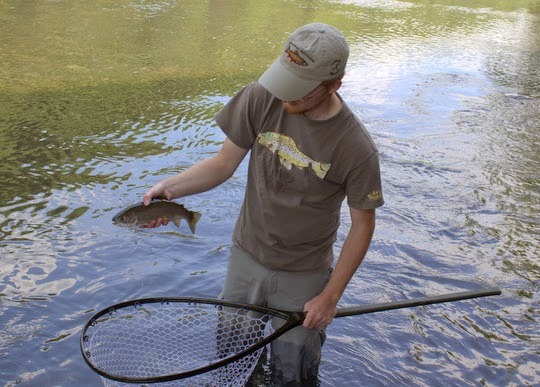 Once that pressure is removed, it allows everyone to relax and most people fish better without too much pressure. Dad was soon in a groove, catching fish and remembering to carefully count, announcing each one before it even hit the net. I reminded him that he couldn't count fish until they were landed, but of course he told me that he was going to land them all. Can't argue with that! Eventually, we got to a shady spot to eat our sandwiches and potato salad. 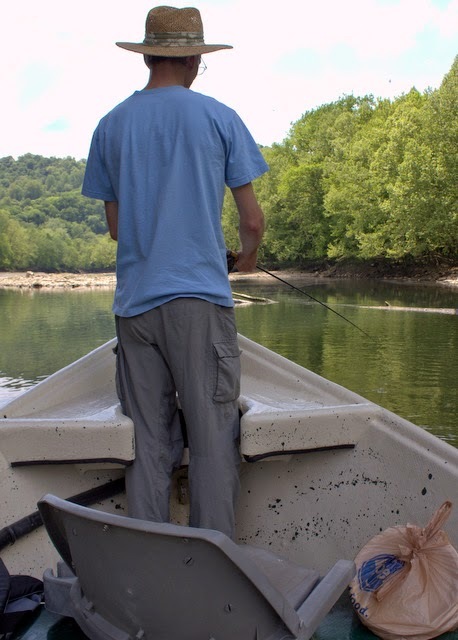 After a delicious lunch, I hopped out of the rower's seat and waded up to the top of a shoal that always holds fish. Working the Sage Accel 904-4, I made a long cast to the middle of the river. Soon the indicator dipped and when the fish flashed I briefly panicked. Thankfully, the next flash convinced me it was not quite as large but still a beautiful holdover. My dad did a fantastic job on the net as I fought the fish down to where the boat waited and then again with the camera. 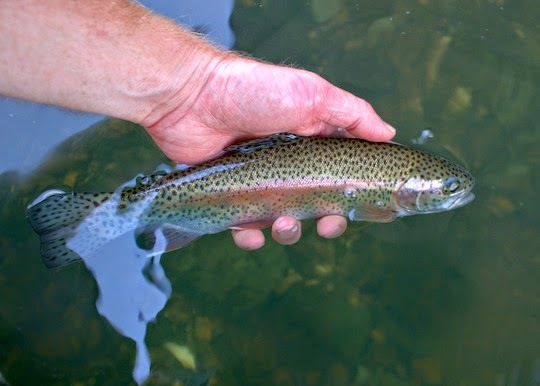 What a rainbow trout! I jumped back behind the oars and my dad quickly resumed catching fish. One promising spot was good enough to anchor on for a few minutes so we both fished. I climbed into the back of the boat and dad was in front. A few casts later, we landed our first double! After the double, I started rowing again since the water would start coming up before too long. I didn't want to get caught with rising water at the boat ramp. 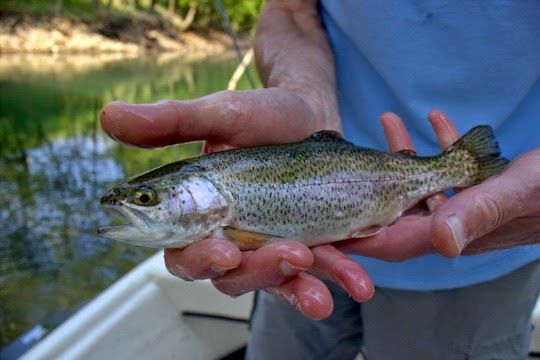 Almost immediately, my dad hooked another trout. The pink stripe was so gorgeous and the fins so healthy that I took a quick shot before I let it go and then one of dad fishing out of the front of the boat. One final spot called for us to anchor up so stopped the boat and we both fished again. 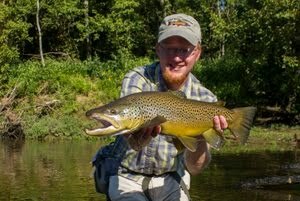 My last fish of the day was a gorgeous 14 inch brown trout that fought like a much larger fish. At this point, my dad was quickly closing in on around 20 trout for the day. Somewhere around 16 or 17 we both lost track but when he caught a few more we decided it must be 20 and probably more. I was impressed with how quickly he caught on and started catching a lot of fish. He was probably getting tired of my "coaching" (hey, it is hard to quit guiding), and I could tell from his casting that he was getting tired. 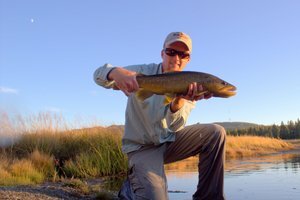 Most people who are not used to fly fishing get tired after a long day in the hot sun catching lots of fish. He hung in until right at the end but thankfully the ramp was just ahead. We pulled the boat out just as the water started to rise and were soon enjoying the air conditioned car on the ride home. Dad got a year long license so I'm sure I'll convince him to get out on the water with me again. You don't want to waste all that money after all! Those are the really good kinds of trips. Good company sometimes trumps good fishing. You're a lucky man David. Spend as much time with your dad as you can. Great post.